Accused person being escorted to the court room by police. A former accountant at the Yendi District Assembly yesterday told an Accra Fast Track High Court where 15 people have been charged for the murder of Ya Na Yakubu Andani II, overlord of Dagbon that he was taken to Tamale by then Yendi District Chief Executive to get the authorities there to intervene in the intra-ethnic conflict between Abudus and Andanis in March 2002. Alhaji Mustapha Imoro, the eighth prosecution witness (PW8) listed on the bill of indictment as PW11 said the DCE Alhaji Mohammed Habib Tijani (the eighth accused person - A8) had taken him as an Andani and Hammed Abukari Yussif aka Kuns (A14), an Abudu to meet Prince Imoro Andani, then Northern Regional Minister on March 26, 2002 over the fighting which had already started a day before. All the 15 accused persons, except Zakaria Yakubu aka Zakaria Forest, the seventh suspect who is currently at large, were in court. They have all pleaded not guilty to conspiracy and with Forest (A7) facing an additional charge of murder. They are currently on remand in police custody except Iddrisu Iddi aka Mbadugu due to old age. 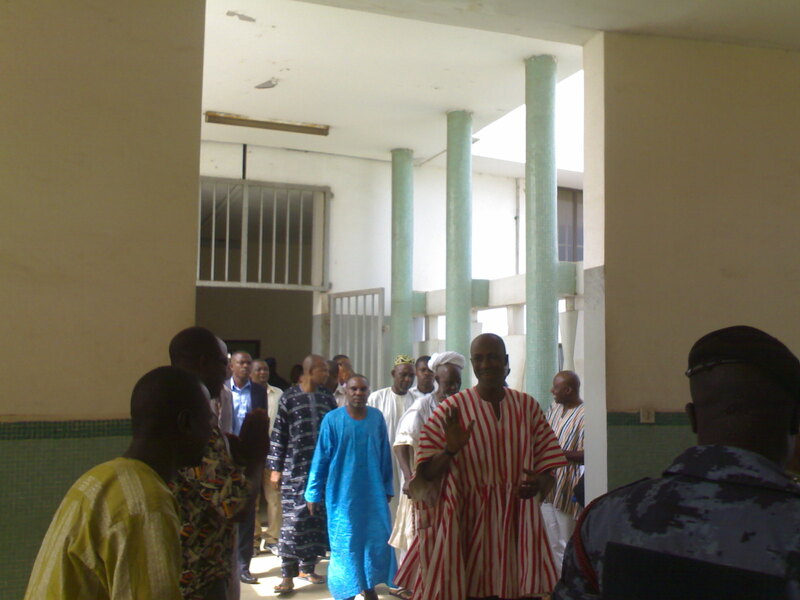 Those on trial are Iddrisu Iddi aka Mbadugu, Alhaji Baba Abdulai Iddrisu aka Zohe, Kwame Alhassan aka Achiri, Mohamadu Abdulai aka Samasama, Sayibu Mohammed, Alhassan Braimah and Alhaji Mohammed Habib Tijani, 45, former DCE of Yendi as second, third, fourth, fifth, sixth and eighth accused persons respectively. Led in evidence by Solomon Atadi, a Principal State Attorney, PW8 who currently works for the Kpandai District Assembly in the Northern Region told the court presided over by Justice EK Ayebi that around 1:15pm the DCE requested him to standby and not quiet long he (DCE) came downstairs and asked him (PW8) to join him (DCE) in his official vehicle to the military barracks in Yendi. He said the driver came to remove the battery of the cesspit emptier and sent it to the military officer to spark the armour car. PW8 told the court that the DCE had said he (DCE) was taking them to Tamale so that they can bear witness to the fact that he was arranging for reinforcement to quell the conflict. The witness said the DCE had told him that he (DCE) did not want anybody to accuse him (DEC) of going to Tamale to recruit fighters for the Abudus. He said the DCE alighted and walked towards the military vehicle and a soldier also alighted and the two talked for a while but did not hear what they discussed and the DCE returned into the vehicle and they left for Tamale. PW8 claimed that on their way the DCE looked at his watch and remarked “at exactly 4pm Abudus and Andanis will clash in Yendi” but during cross-examination he admitted that the fighting had started a day before (25th March 2002). He said they drove straight to the Tamale Regional Coordinating Council and upon hearing that the Regional Minister had gone to a place called Andy Lodge for a break they followed him (Minister) there. He said the DCE briefed the Minister about the deteriorating security situation in Yendi and he (DCE) suggested that the then National Security Advisor Lt. Gen.
Josuah Hamidu should be contacted on the issue but the Minister said he did not remember the General’s number. He said the DCE then said he was with one Andani and he (PW8) was given the phone to talk and he took the opportunity to tell the General that the Ya Na was not safe in Yendi and the General replied that he (PW8) should tell the Ya Na that Accra had sent 60 soldiers to come to Yendi to assist. He claimed the General had told him to tell the Ya Na that he should feel free and if the need arises they will re-impose the curfew and then handed the telephone to the DCE. He said the Minister at a point said they should leave them to fight and whoever becomes victorious should be and he (Minister) said he was on his way to Accra. PW8 said they left the Minister’s lodge and came out to pray and during the ablution he saw that the DCE (A8) and A14 were wearing local bulletproof under their dresses. He said they returned to Yendi and went straight to the Divisional Police Headquarters and met the BNI officer called Derry and another police officer who said there were about 100 policemen and water cannons in town. He said around 9pm he was taken to the military barracks together with the DCE, the BNI man and the police officer to join the soldiers there and when the BNI man requested security around the palace the army officer said he was not taking instructions from anybody. He said after a while he realized the security could not help to stop the fighting so he left and hid himself and on the next day March 27, 2002 the fighting intensified. During cross-examination by defense counsel Phillip Addison PW8 said he did not testify at the Wuaku Commission (The body set up by President Kufuor to investigate the murder of the Ya Na) because he was not invited and told the court that he was not interested in what was going on at the commission. He denied that the Andanis put pressure on him not to go to Wuaku to say he had been to Tamale with the DCE because the DCE was his friend. Where were you on March 25, 2002? Witness: I was at home. (Then witness changed his statement to) I was at work. I thought 25th was a Sunday. Witness: We heard single gunshots towards the palace. Counsel: How did you know? Witness: When I hear the sound of single barrel gun I can know. When I hear the sound of AK 47 or G3 I can know. I heard the sound of single barrel gun. Witness: I can’t disclose it (Counsel probed further and witness said) It was women who were running from town towards Gushegu road. When counsel put it to him that General Hamidu could not have passed on a message to the Ya Na through him (PW8) when there were political and regional heads the witness said it was because the DCE and the Minister could not go to the palace. He admitted travelling with the DCE’s driver in the same vehicle from Tamale to Accra in May 2010 when the police invited him to give his statement and said they conversed on their way to Accra. Sitting continues on Tuesday October 12, 2010.